Tropical paradise is only a short flight away. 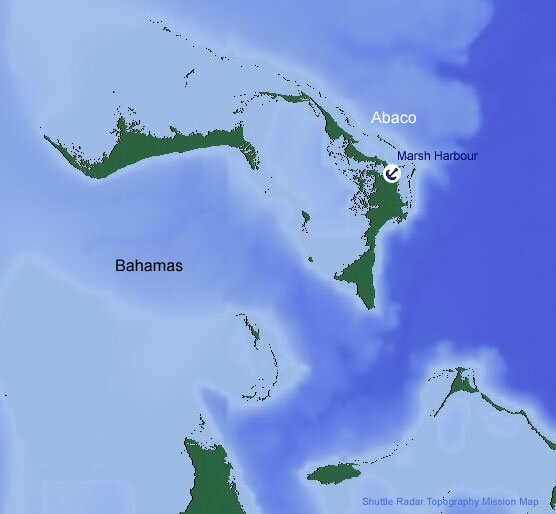 Within hours you'll be enjoying the turquoise waters of the Sea of Abaco and the Bahamas. Stretching 130 miles form north to south, there are dozens of pristine islands to be explored. It is smooth sailing from one picturesque spot to the other, where you'll find snug harbors, deserted white sand beaches, and cozy Caribbean villages. Whether for a week-long tropical island tour, a day sail with the family, or a week end getaway, we have the boat to accommodate your needs. Snorkeling, diving, fishing, kayaking, windsurfing, shopping, romance, fun... something for everyone is awaiting. BAHAMAS BAREBOAT CHARTERS - The ultimate in privacy & freedom, bareboat rentals are for groups having their own qualified skipper. Hiring a captain and or hostess/cook always remains an option. For a list of our available Bareboat yachts, please Click Here. Fly in and sail out of the Bahamas fleet base, located at the luxurious Abaco Beach Resort & Boat Harbor. Enjoy all of the resort amenities while in port - fine dining, private beach, swim-up pool bar, dive shop and more - before casting off for the Sea of Abaco. Stretching 130 miles form north to south, there are dozens of pristine islands to be explored. It's easy sailing from one idyllic spot to the next, where you'll find snug harbors, deserted sandy white beaches and captivating villages. Drop anchor at Hopetown whose candy-striped lighthouse provides a picturesque landmark to steer by. The flowering gardens, quaint pastel cottages, and white picket fences are reminiscent of the New England "Loyalists" who settled here. Whether you head north to Green Turtle or south to Little Harbour you are in for some of the best cruising the Bahamas has to offer. Our new luxury base at Palm Cay is located a mere 35 minutes south-east from the Lyndon-Pindling Airport (NAS) and away from the noise, hustle and bustle of the congested Nassau city center. No more bridges and marine traffic when you leave or arrive back at the marina. You will no longer have to tackle the heavy currents or the jet skis and tourist boats when trying to reach or leave from your dock. Best of all, you will now be directly in line with the Exumas and only 25 nautical miles away from the start of this beautiful chain of islands. And you still wish to visit Nassau center and Paradise Island? The excitement is an easy 20-minute cab-ride away. Located in Great Exuma Georgetown. The Exuma Islands have everything that makes the Bahamas one of the premier yacht charter locations in the world: delightful small islands, pristine white beaches, interesting and historic places, exotic creatures, friendly locals. All 120 miles are a yachting paradise! The Islands Of The Bahamas offer boaters and sailors some of the most spectacular and breathtaking views in the world. Panoramic views of pink sand beaches, towering cliffs, clear blue waters, and colourful reefs await adventurers. With thousands of miles of uninhabited beaches and cays, visitors can literally get away from it all and enjoy the peace and tranquility so easily found in The Islands Of The Bahamas. With one of the world's largest barrier reefs, a quarter of the world's coral lying in the waters and exceptional sailing conditions, a Bahamas sailing itinerary around the Abacos promises an unforgettable sailing vacation. Just a short distance from Florida these islands are a favorite among families, and loved by sailors the world over. You can now explore the Exumas on a roundtrip basis, departing from Nassau. This Bahamas sailing itinerary around the Exumas promises an unforgettable sailing vacation. This beautifull islands are a favorite among families and sailors. Below you will find links to additional information we are certain you will find useful pertaining to your yacht charter vacation in The Bahamas. Practical Travel Info: For useful tourism related information for the Bahamas.